The Brewery List for the 2018 Winter Ales Festival has been revealed! This year we’re excited to be working with 42 different breweries from New Zealand & 2 from overseas to offer a total of 45 different beers to punters (1 beer is a collaboration, and 2 breweries have 2 beers). While there is some stress on big and bold beers that are fit for winter, we did our best to pick a range that features a variety of styles, ingredients and alcohol levels. We also will have a fair few on Nitro or Handpull, and will have a few true casks pouring as well. We will start to release individual beers in the coming days, and you can stay updated on the Beer List page, on the Beer List Google Sheet, or on the Winter Ales Festival Facebook Event Page. Thanks to all of the breweries for participating, and see you all in a couple weeks! We are excited to announce Winter Ales Feast, a new addition to the offering from SOBA‘s Winter Ales Festival. While we pride ourselves on the festival only taking place over one day, we wanted to spread the love and highlight more of the good food and good beer for which Wellington is known. For this inaugural event, we’ve teamed up with Davey, Quentin & Tommy at Ortega Fish Shack to create a 5 Course Menu to pair with 5 beers from some of our favourite New Zealand breweries. We won’t announce the beers until the night, but the Ortega team and a few of the brewers will be present to help guide us through the night. The Winter Ales Feast will start at 6:30pm on the night, but we are inviting people to arrive from 6pm. Please write john@winterales.co.nz with any questions or enquiries, and hope to see you there. We are excited and overwhelmed to announce that Earlybird Tickets for the 2018 Winter Ales Festival are now sold out. Over one-third of all available tickets were Earlybird, and it is great to know that there are a bunch of good beer fans out there that are excited for this year’s festival! We’ve been working with breweries around New Zealand to dial in the beer list, and there are definitely some beers debuting that are not to be missed. There are still General Admission tickets available, but these have been selling steadily and we are anticipating a sell out. Grab your tickets while they’re still around, and we’ll see you on Saturday, July 7! Earlybird Tickets for Winter Ales Festival 2018 will be available on the Tickets Page from Friday, April 20. We’re proud to announce that the Society Of Beer Advocates (SOBA) are back sponsoring Winter Ales Festival again this year, and we’d like to extend our thanks to Craft Beer Capital for making it happen last year. 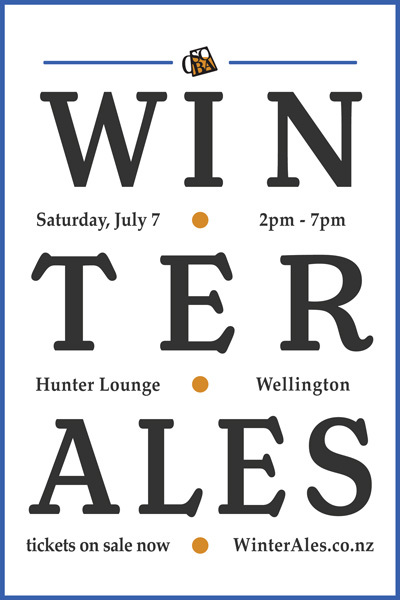 Winter Ales Festival will be back at The Hunter Lounge at Victoria University on Saturday, July 7th from 2pm – 7pm. 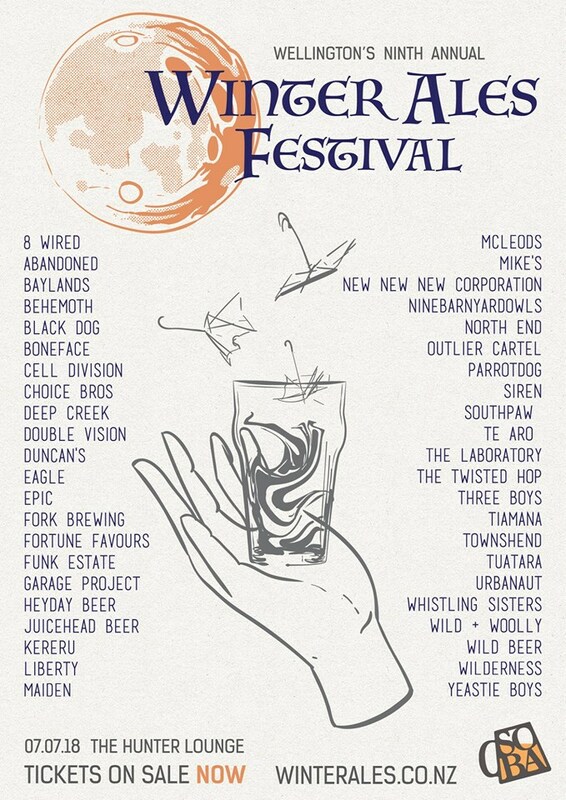 The festival will feature around 40 limited and new-release beers on tap and hand pull. Most of the beers will be from New Zealand, but there will likely be a few surprises from overseas as well! Keep an eye on the Beer List Page or on the Facebook Event Page for more details. Current SOBA Members will be receiving an additional discount code via email to save on tickets. If you’re a current member, be sure to check your email before purchasing! If you have any questions, please check out the Winter Ales Festival FAQ or email info@winterales.co.nz.